Verily, Gita is the most influential scripture in Indian thought. It represents, in the words of Sarvapalli Radhakrishnan, "not any sect of Hinduism, but Hinduism as a whole, not merely Hinduism, but religion as such, in its universality, without limits of time and space, embracing within its synthesis the whole gamut of the human spirit, from the crude fetishism of the savage to the creative affirmations of the saint." The main feature of the development of the Hindu ethos has been its ability to adapt with the tides of history, while always maintaining continuity with the past. The spiritual and ethical teachings transmitted by Gita are still capable of inspiring and shaping the lives of millions of people. As a collection of timeless truths that are as valid today as they were thousands of years ago, Gita will remain a guiding light for generations to come in the turbulent ocean of life. Gita refreshes and re-vitalizes the mind of the man caught in the mesh of modern dialectics, in the pride of modern science, in the cynical scorn of modern superficiality. Its teaching has the power to comfort, console, and confer strength and faith to the conflict-ridden hearts. The wisdom flowing from its seven hundred inspirational verses makes Gita the carrier of the eternal message of hope, love and joy in life for the entire humanity. The sweet music of the ‘Song Celestial’ soothes all--the householder and the recluse, the prince and the pauper. 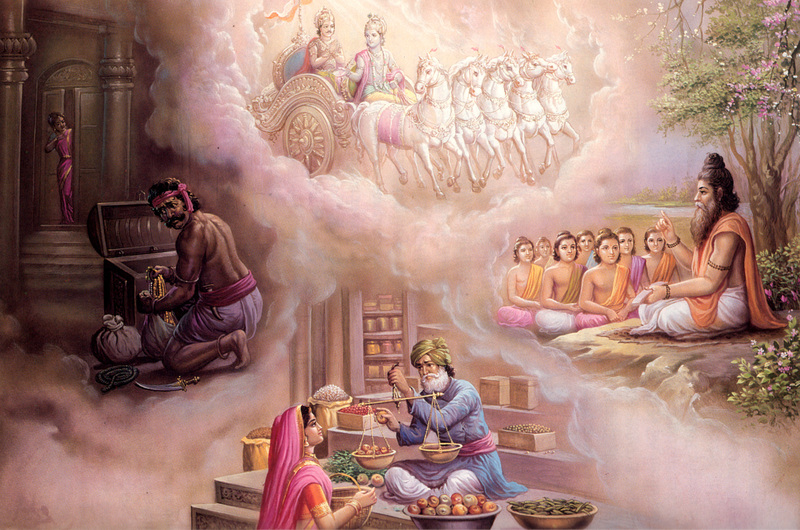 The great merit of the Gita is that it does not preach an impossible and austere morality. It is, in fact, a layman’s gospel and its message is capable of being renewed. It does not and cannot become out of date with the passage of time. In view of its catholicity and its psychological approach, men and women, young and old, have turned to Gita in times of crises when their minds were tortured by doubt and torn by the conflict of duties. It is a pity that Gita has been dubbed by some as an extremist metaphysical document full of killer apps. They conveniently ignore Gita’s central message upholding high moral principles and lofty human values. So, when Sri Krishna exhorts Arjuna to kill Bhishma, in whose arms he grew up, his teacher, Drona, from whom he learnt archery, or his cousin, Duryodhana, who worked endlessly to destroy his family, the skeptical and the superficial mind will only smell preaching of violence. 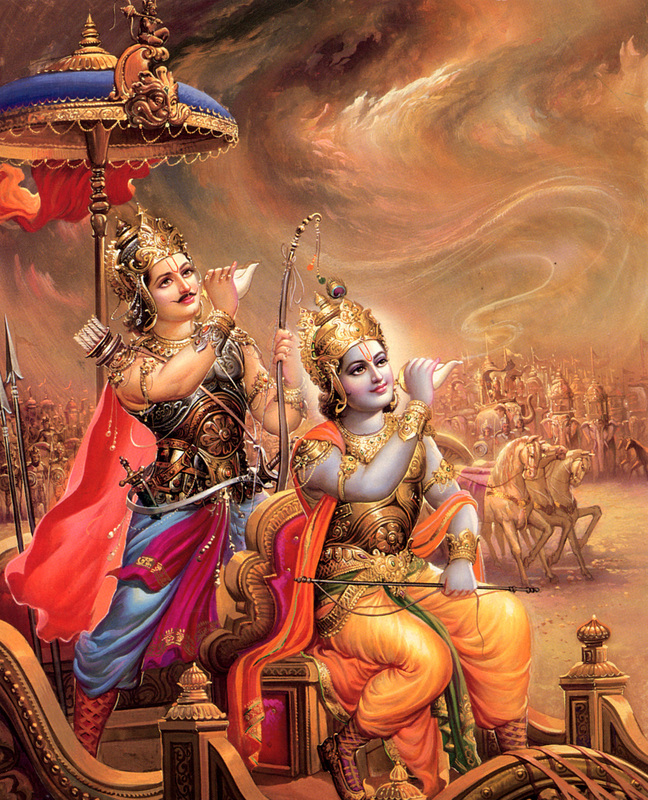 Shri Krishna undoubtedly exhorts Arjuna to fight but why, one should try to know. 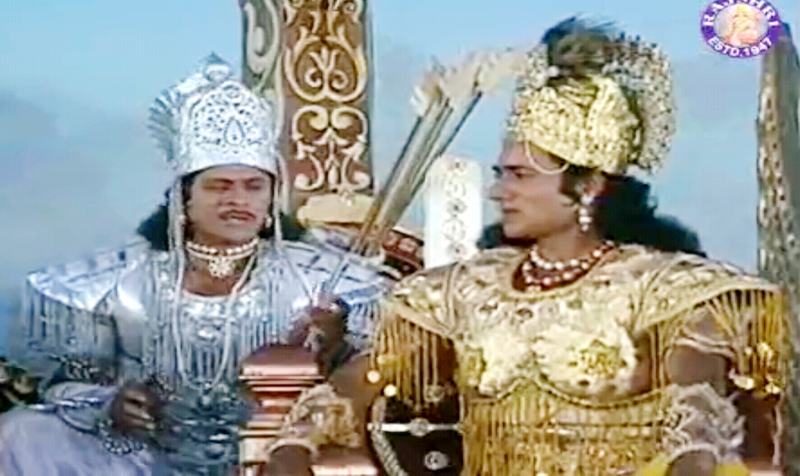 The fratricidal war was forced on Arjuna by the haughty Duryodhana, who refused to give Pandavas even a small village, leave aside their rightful claim to live. 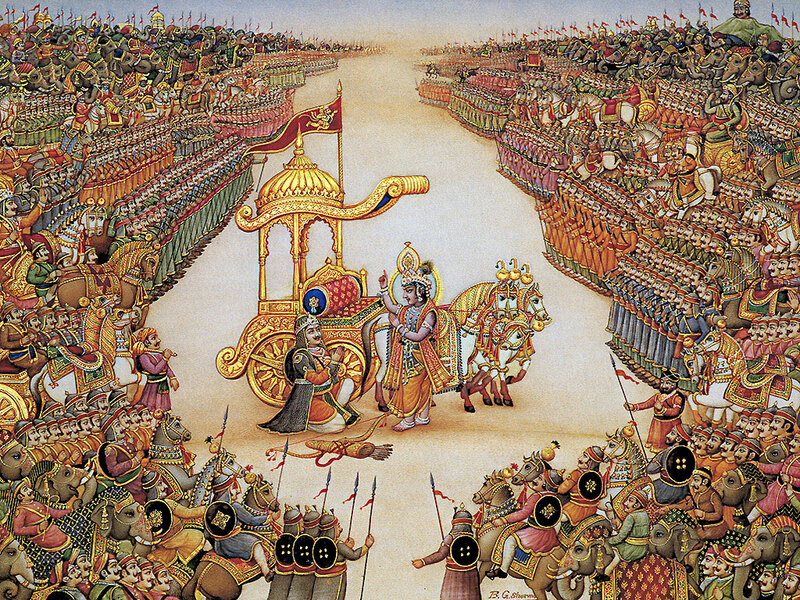 The ego-centric Duryodhana also spurned peace moves by Shri Krishna and also the pleadings of peace by the highly respected grandsire, Bhishma and other reputed generals of his army. In his lust for pdower, Duryodhana let loose a reign of terror, even outraged the modesty of virtuous women, Draupadi, in particular. Perhaps no better setting could have been given to the philosophy of life than the battlefield. What actually was on stake in this conflict was truth, righteousness and ethics (dharma). Kauravas had gained the kingdom by adharma, and if Shri Krishna had allowed them their diabolic (adharmic) deeds, it would have created for the posterity a precedence of the victory of evil (adharma) over good (dharma). Arjuna is a soldier and it is a soldier's duty to fight. Not doing so would, in fact, be a greater sin. Shri Krishna diagnosed Arjuna's problem and decided on psychological surgery, as it were, using the sharpest words as knives. "Oh, Arjuna! ", he says, "this cowardly nervousness of yours in the face of a crisis does not behoove a man of your caliber. You cannot run away from duty, realizing that the essential thing in a human being is not the body or the senses, but the changeless spirit. All talk of killing or being killed is meaningless. If, in your vanity, you say, 'I will not fight', your resolve is in vain. You cannot arbitrarily shun your duty, for in that case the whole system of values will be upset." And when finally Arjuna got over his despondency and got ready to fight, Sri Krishna reminded him of the actual purpose of his new-found spirit of intense action, not for his own benefit, nor for satisfying his own greed and desire but for the good of many, with faith in the ultimate victory of good over evil, of ethics over unethical actions and of truth over untruth. At this point, it will be proper to remind ourselves that Mahabharata war cannot be compared to a battle in modern warfare. It was more like a tournaent governed by complex human rules of ancient Indian chivalry. A foot soldier could not be attacked by one mounted on an elephant. No one could be shot at while running away. No one would be killed who may have lost or misplaced his weapon. And on top of it, the opposing armies would stop fighting in the evenings and even visit each other and fraternize during the night. It was at the crucial moment of shock-therapy on Arjuna that Shri Krishna dwelt on the principle theme of Gita which is to act without attachment. This single verse from the song celestial should be one of the fundamental drivers in our lives. It gives us a direction that will never give rise to despondency. It is universal in its scope and it revolves round the attitude toward work. We have a right to action only but not to the fruit there-of. All work, whether it is that of a student, a farmer, a factory worker or a merchant, is equally and vitally important. Gita would want us to do our duty but remain indifferent or unattached to the results of the works we undertake. At the same time Gita insists that we cannot run away from action. A surgeon operating on a child has to be emotionally detached but at the same time he has to be professionally committed to his/her work. In fact, without emotional detachment, professional commitment may not be at all effective. No matter what challenges you face in life, your right is only to the works, not to the fruit there-of. Never should you be impelled to act for selfish reasons, nor should you ever be attached to inaction. Since all of us have ups and downs in life, we must learn how to balance ourselves and overcome grief. At the end of the day, life is the greatest teacher. Arjuna did realize that he was bound by Karma, the law of cause and effect which had brought him face to face with the particular situation he was in. And thus, he had his lost mental equilibrium restored completely. Long before Buddha, Krishna propounded the psychological truth that ignorance of one’s nature lay at the root of all troubles in the world. 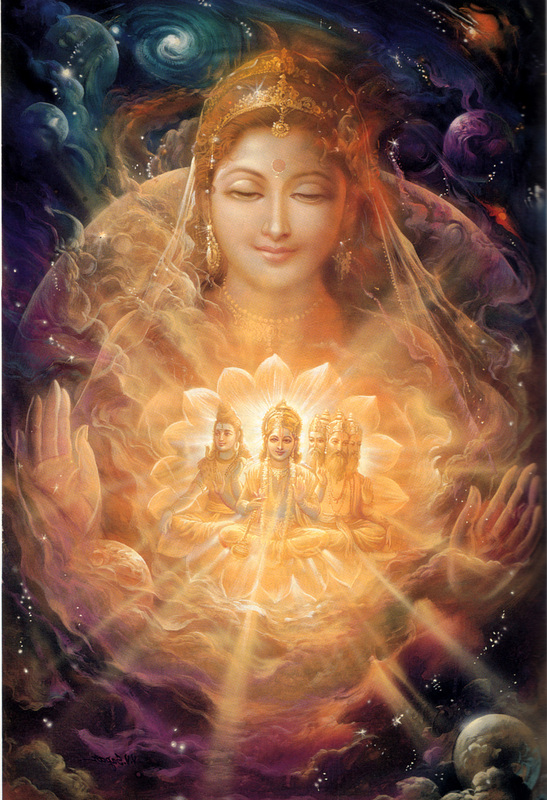 That explains why the divine teacher discusses in Gita the nature of man, composed of the transient body and the eternal soul. He says, the wise man adopts an attitude of equanimity to all external objects and obtains Internal calm not by stopping sense activity altogether but by engaging in action without any idea of a result. Action has to be performed. The whole universe is in motion, ever evolving and ever moving. The cosmos is an organism with the principle elements and forces like the sun, moon, air, water, fire, electricity and magnetism at work. We must recognize this fundamental truth underlying the mechanism of the universe. Shri Krishna tells us that action performed in a spirit of detachment leads to true wisdom, to the knowledge of what is behind action, behind all life. And with the growth of this knowledge, the need for further action will gradually fall away and the law of Karma will then cease to operate. Whenever one is confused, feeling low or very happy, you can pick up any verse from the Gita and it will show you the way. 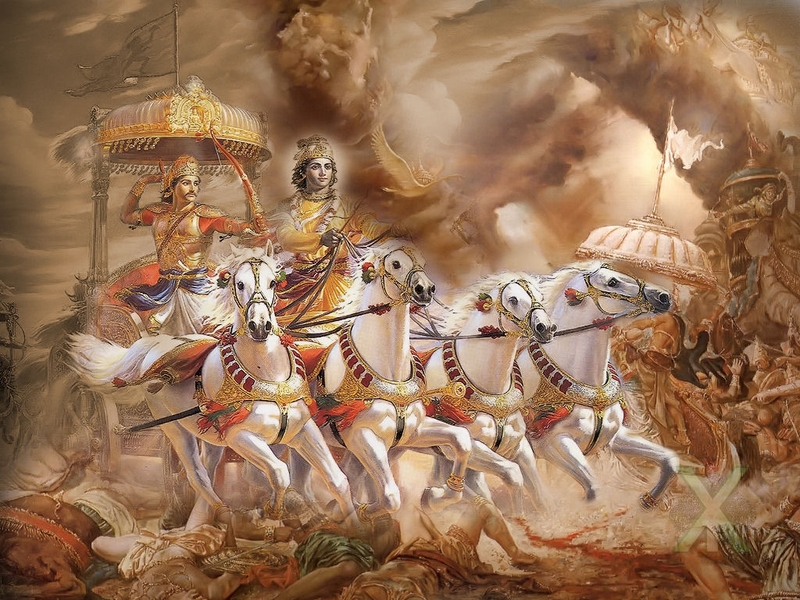 Since the dilemma that enveloped Arjuna on the battlefield of Kurukshetra is the one that can afflict any cultured or refined mind anywhere, anytime, the Gita has an abiding value for all, irrespective of place and time. Allegorically, Arjuna represents man in a great crisis in his life. He typifies the struggling individual who feels the burden and mystery of the world. He does not know what is right and what is wrong. The mood of despair in which Arjuna finds himself in is what the mystics call the 'dark night of the soul', an essential step in the upward path. For the great Saiva philosopher of Kashmir, Abhinavagupta, the battle between Kauravas and the Pandavas was simply a conflict between the forces of knowledge (Vidya) and those of ignorance (Avidya). The ‘Song Celestial’ reveals a way of life by which the so-called worldly actions themselves become means for inner spiritual growth. One need not leave one’s field of action with all its intrinsic conflicts and pains to start the divine trek to subjective illumination. Robert Oppenheimer, the American theoretical physicist, famously known as the father of the atomic bomb uttered the words 'Now, I am become Death, the destroyer of worlds', after he had seen the fireball glowing after the bomb had been dropped. He was in effect quoting from verse 32 of Chapter 11 of the Gita. 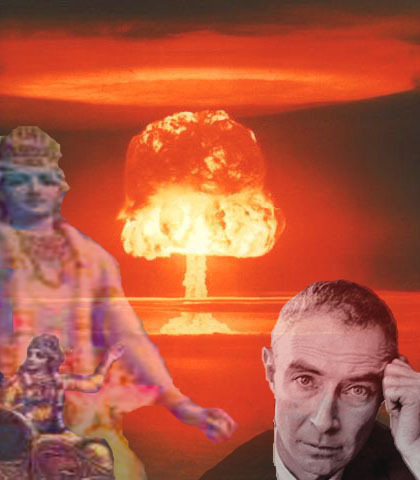 Although raised in a Jewish environment, Oppenheimer was deeply influenced by Vedic philosophy. He never converted to Hinduism nor did he ever refer to himself as a Hindu but he did take up Sanskrit lessons so as to better understand the Gita. He always gave Gita as a present to his friends and kept a copy on the shelf closest to his desk. At Franklin Roosevelt's funeral, he read a passage from the Gita which says, "Man is a creature whose substance is faith. He is what his faith is." (17/3). In 1963, the Christian Magazine asked him to list his 10 most influential books, he chose the Bhagavad-Gita as one of them. He admitted himself that he had blood on his hands but was adamant that he had done the right thing. He believed that the bomb would save more lives by stopping the carnage that was World War II in that the bomb would frighten other would be aggressors thereby, in theory, preventing many future conflicts. History bears witness to the fact that various forms of evil have manifested in the world from time to time, like caste-ism in India, apartheid in South Africa, Nazism in Germany and slavery in America. Its latest manifestation, terrorism, is the most sinister contemporary evil that has bedeviled the entire world in modern times. The civilized world continues to seethe under the threat of spontaneous acts of terror on civilian targets as evidenced by the recent attacks in Paris and California. Pakistan's reputation as a breeding ground for terrorism again came up for scrutiny after US authorities found the perpetrators of California carnage to be supporters of Islamic State, who, in turn, called them martyrs. Faced with challenges from fundamentalists and extremist organization like ISIS, humanity needs to be guided by a larger vision and wisdom. It is here that we must turn to the religion of the Bhagwadgita, which is catholic in its message, comprehensive in its outlook and universal in character. And it is time that we rouse Arjuna in us, wake up to our potential and free the world of terrorist menace. And for this, we have the necessary assurance from Gita in the dictum “Yato Dharmah Tato Jayah” meaning wherever there is righteousness, there will be victory. Gita-What they say about it? 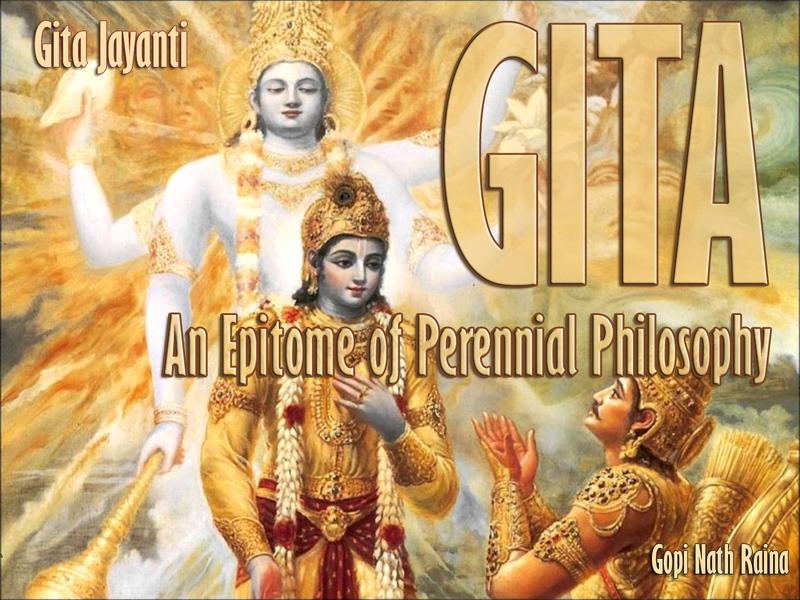 Regarded as a work of impeccable integrity, Gita occupies a highly significant place in the intellectual, ethical and spiritual life of modern man. What follows is what the greats of the world have to say about it. When I read the Bhagavad-Gita and reflect about how God created this universe everything else seems so superfluous. "In the morning I bathe my intellect in the stupendous and cosmogonal philosophy of the Bhagavad-gita, in comparison with which our modern world and its literature seem puny and trivial." 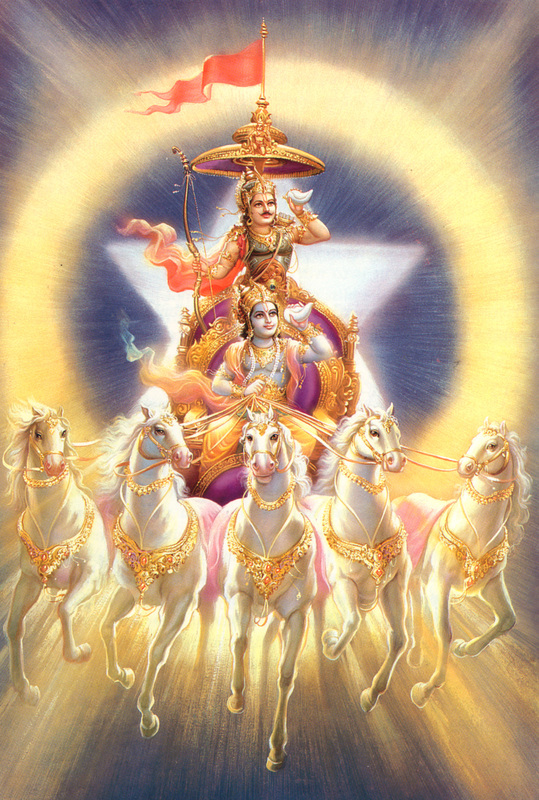 Bhagavad-Gita is the manifest quintessence of all the teachings of the Vedic scriptures." The Bhagavad-Gita is a true scripture of the human race a living creation rather than a book, with a new message for every age and a new meaning for every civilization. The marvel of the Bhagavad-Gita is its truly beautiful revelation of life's wisdom which enables philosophy to blossom into religion." "I owed a magnificent day to the Bhagavad-gita. It was as if an empire spoke to us, nothing small or unworthy, but large, serene, consistent, the voice of an old intelligence which in another age and climate had pondered and thus disposed of the same questions which exercise us." "In order to approach a creation as sublime as the Bhagavad-Gita with full understanding, it is necessary to attune our soul to it." "The Bhagavad-Gita is one of the most clear and comprehensive summaries of perennial philosophy ever revealed; hence its enduring value for all of humanity." Gita can be seen as the main literary support for the great religious civilization of India, the oldest surviving culture in the world. Our highly activistic and one-sided culture is faced with a crisis that may end in self-destruction because it lacks the inner depth of an authentic metaphysical consciousness. Without such depth, our moral and political protestations are just so much verbiage. No work in all Indian literature is more quoted because none is better loved in the west than Bhagwadgita. Translation of such a work demands not only knowledge of Sanskrit but an inward sympathy with the theme and a verbal artistry. For the poem is a symphony in which God is seen in all things. If truth is what works, as the pragmatists insist, there must be a kind of truth in the Bhagwadgita since those who follow its teachings display a joyous serenity usually missing in the bleak and strident lives of contemporary people. *A journalist by profession, a scholar by temperament and a writer by choice, Gopinath Raina was inclined to study of religion from very young age. It was Vivekananda’s dynamic exposition of Hindu thought that fired his imagination while he was still at school. By the time he entered college, he had been drawn to the writings of Gandhi, Aurobindo, Narayana Guru, Radhakrishnan and Bertrand Russell. 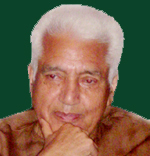 After retiring from Indian Information Service in 1983 after completing 35 years as an editor and a correspondent in All India Radio, he edited AICC Journal, Varnika, (Jan.'84-Dec.'90), Koshur Samachar (March '91-Oct '95), Sanatana Sandesh,(1997-2005) and KASHEER (2003-2004), He has since been writing on various aspects of Hindu thought, particularly on saints and sages. Presently he lives in Miami spending his time writing personal memoirs. Namaskar. This is an article for the ages. Feel enlightened and empowered. A timely masterpiece. Gita is a true scripture of the human race with a message for everyone irrespective of his or her religion. We all know the significance of this true to life sacred book but the author has provided a true inspirational depiction in this worth reading article. Bhagavad Gita is more than a section of the massive Indian epic Mahabharata and the writer has done justice in its narration. I had the pleasure of living close to to the author in Miami USA from 1998 to 2000.He was closely associated not only with the KP community but all the Hindu community. He edited a local journal and organised Hindu festivals at temple. The write up on the Bhagwad Gita reflects his deep understanding of the message from this Vedic Scripture which is eternal and hard to translate twice the same way.I pray for his good health. An eye opener for the younger generation this may help them to remain attached to the roots. Hope many more stories to follow soon. Thank you Papajee. Just as Bhagawan Shankaracharya rendered an immense service to the humanity by pulling the "Song Celestial" out of epic Mahabharata, Shri Rainaji's article is of an almost equal significance in reintroducing the present generation to this "Text Book of Philosophy and Literary Erudition." Pray, he continues to enrich the society with his future endeavors. The author has provided great insight on Gita which is a masterpiece and has connected it to our daily life regardless of our religion or age. Enlightened by this article which provides a deep message. I know the author, he is a great soul hope he continues providing us the inspiration and guidance. Thanks Papaji stay blessed with good health.